Secure Data Eraser overwrites data in either fast or secure erase algorithms with multiple passes using overwrite patterns designed to achieve military-strength security. 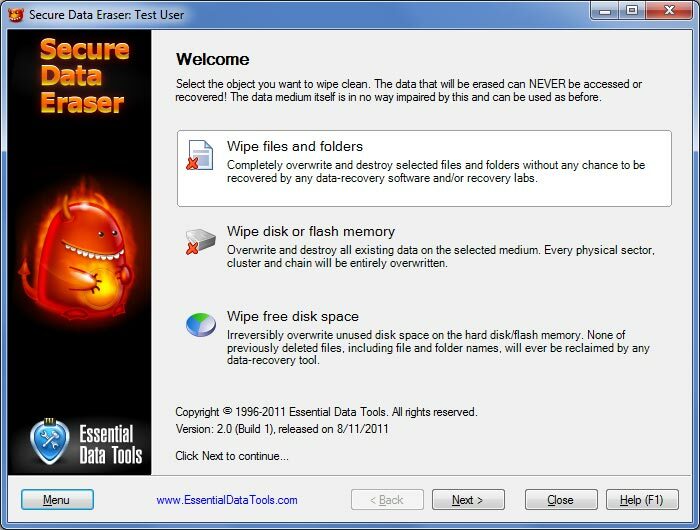 Secure Data Eraser erases files completely, so sensitive information CAN NEVER BE ACCESSED OR RECOVERED using any data recovery software or even in a special data recovery laboratory. Zeroes - Filling with zeroes in one pass. Fast. Pseudo-Random - Filling with pseudo-random numbers in one pass. Fast. Hides the fact that the data is wiped. * Defined in the National Industrial Security Program Operating Manual of the US Department of Defense. ** Based on Peter Gutmann's paper "Secure Deletion of Data from Magnetic and Solid-State Memory". These patterns are designed to effectively remove the magnetic remnants from the hard disk making it impossible to recover the data. As an alternative, you can modify any pattern and create new ones for your special needs! Secure Data Eraser is shareware. If you would like to use all its features a registration is required. You can order the fully licensed version of Secure Data Eraser over the Internet with any major credit card. The most important feature of ObjectWipe - it leaves the XP System restore points intact, unlike several others that use all of the disk space causing system restore to shut down or just delete all restore point information. ObjectWipe is simple and it does everything that it should very well.